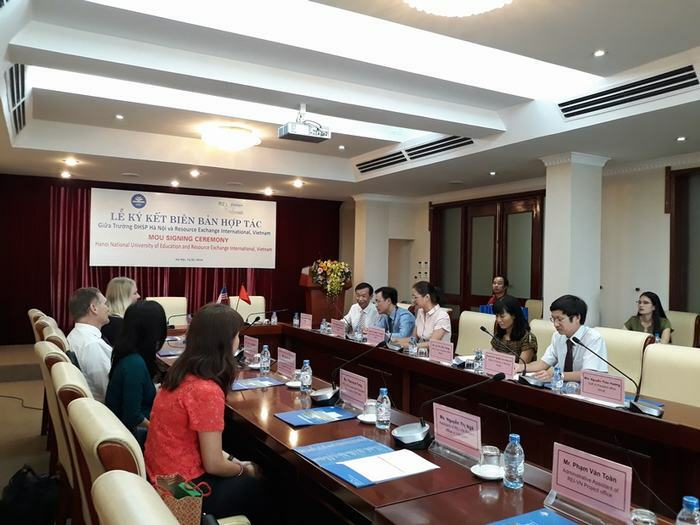 The delegation from Hanoi National University of Education included Prof. Dr. Nguyen Van Minh, Hanoi National University of Education President; M.A Nguyen Nhat Tan – Head of President’s office; Assoc. Prof. Dr. Nguyen Thuy Nga – Deputy Head of President’s office; Dr. Le Thi Thu Trang - Deputy Head of Academic affairs; Assoc. Prof. Dr. Nguyen Lan Hung Son – Dean of Faculty of Biology; Assoc. Prof. Dr. Tran Thi Thanh Huyen – Deputy Dean of Faculty of Biology. The delegation from REI-Vietnam included Mrs. Tran Phuong Lien - Chief Representative of the REI Vietnam, Ms. Alyssa Meyer – volunteer of REI Vietnam in Hanoi National University of Education; Mr. Loren Lancaster – REI’s teaching specialist for teachers and students, Mrs. Zonia Go – REI’s English teaching specialist, Mrs. Florence Fong – REI’s social work specialist. The MOU signing ceremony was also attended by representatives from REI Office in Vietnam, and staff from the Faculty of Biology. REI - Vietnam (Resource Exchange International) is a US non-governmental organization which has been officially active in Vietnam since 1997 in assisting and developing the fields of education, health and agriculture. The purpose of REI-Vietnam is to train people to help the country. 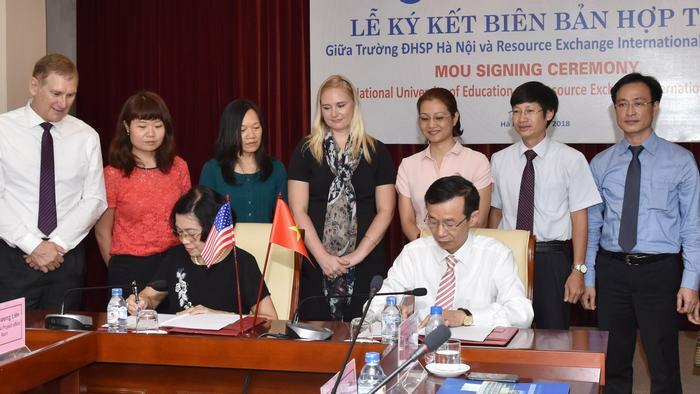 Based on the MOU agreement, REI-Vietnam introduced Alyssa Meyer (USA) to volunteer at the Faculty of Biology in 11 months. When working in the Faculty of Biology, international volunteers will support English language-developing activities for staff and students through English Club, assist in searching training program of the United States to develop those programs towards international integration, language support when training the major in English. 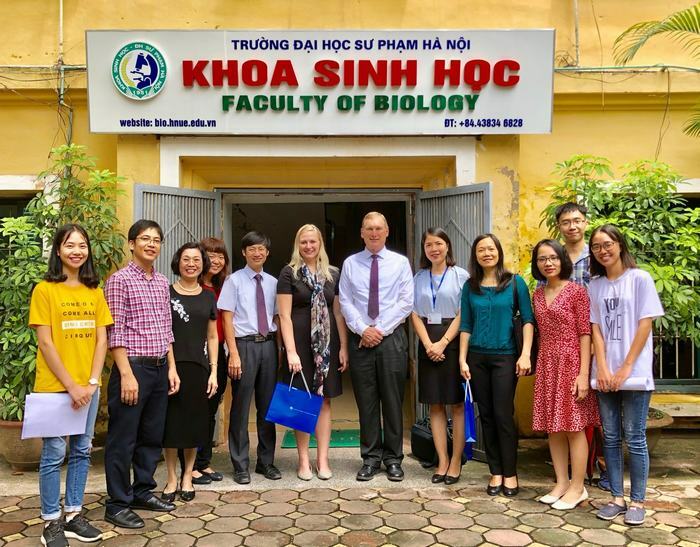 At the same time, Ms. Alyssa will be expanding the connection with REI's international volunteers working in Vietnam to support other activities of the Faculty of Biology and the University. Giving speech at the signing ceremony, Prof. Dr. Nguyen Van Minh – University President thanked the enthusiastic support of REI-Vietnam and hoped to receive more international volunteers in the future. 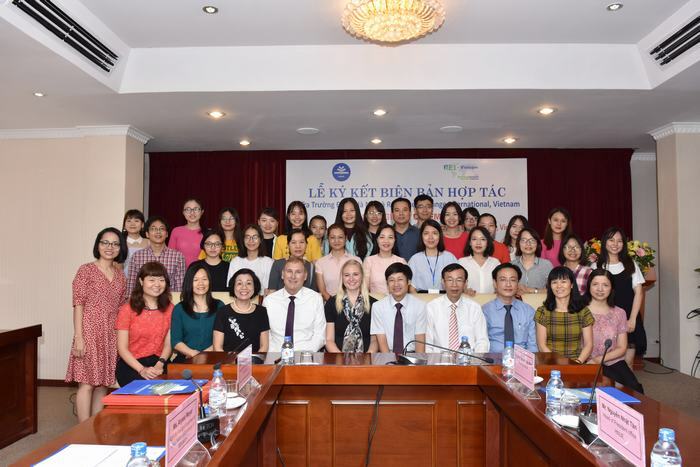 Ms. Alyssa Meyer, an international volunteer, thanked the school leadership for creating a favorable environment for her to work in an open and friendly teacher training environment.